Just in case you missed my Snaps last week, I have terrible lighting in my current abode. There is almost zero natural light, which makes taking photos inside extremely difficult! It’s either too bright because I’m so close to a window, or too dark because I’m too far away from one. There’s really not a middle ground here! With that said, my apologies that these photos aren’t up to my usual standards, but I’m SO excited to share this recipe with you. I haven’t been back to Austin in a few months, which means I’ve been lacking on the food posts (I like to shoot in my mom’s beautiful kitchen). I’m going back in a couple weeks, so hoping to shoot some more for you while I’m home! I shared this recipe on my SnapChat a couple weeks ago. 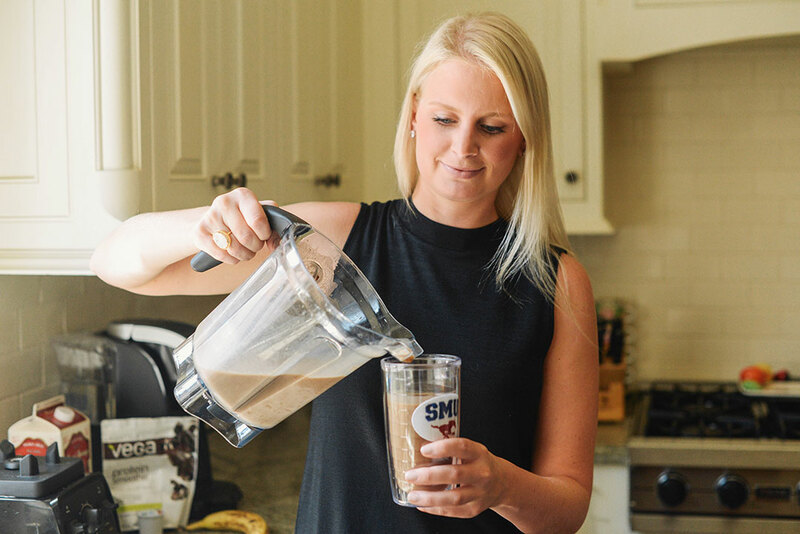 It’s my go-to smoothie if I’m wanting a lighter lunch, or need a little more of a protein punch at breakfast before a big workout. 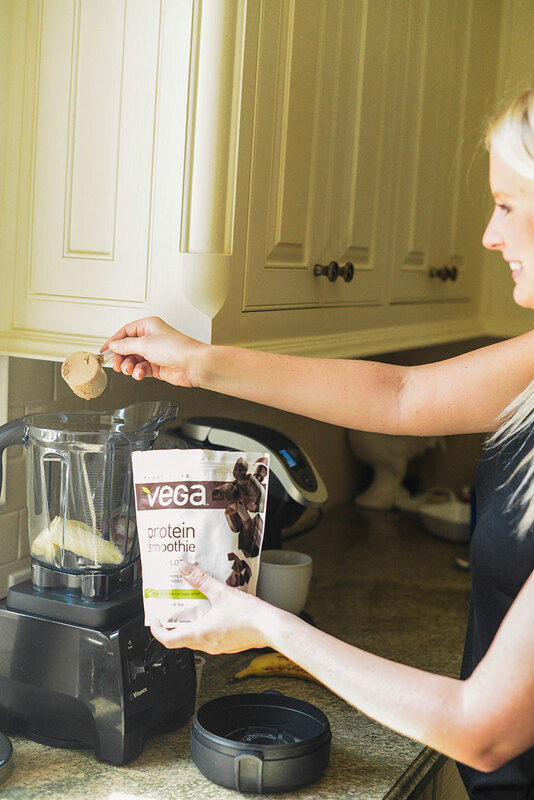 This recipe is SO easy to make, low-cal (only about 220 calories), and features 15 grams of complete protein, as well as two servings of veggies! Oh, and it’s delicious. Prepare coffee using your Keurig (or other). Pour almond milk into coffee mug with the coffee you’ve just prepared – eyeball it, but if your coffee cup is the same size as mine above it should nearly fill to the top! 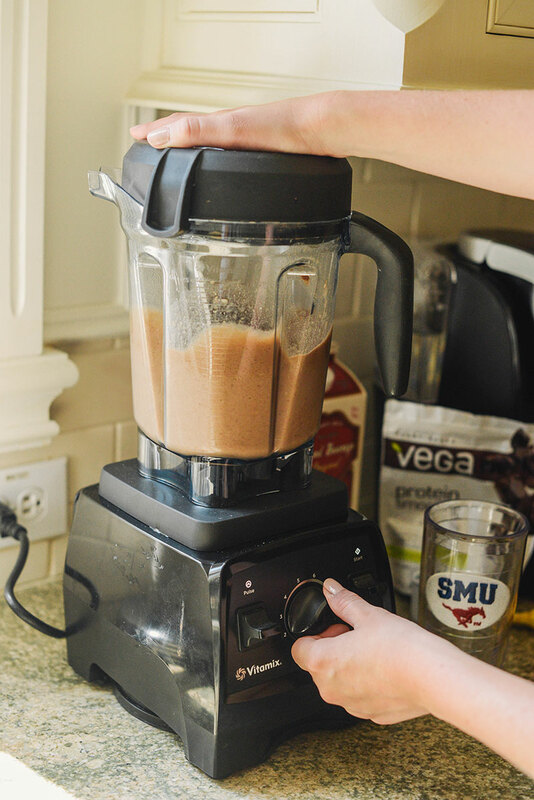 I pour the almond milk into the coffee cup to give the coffee a chance to cool off before tossing it into the blender with everything else. 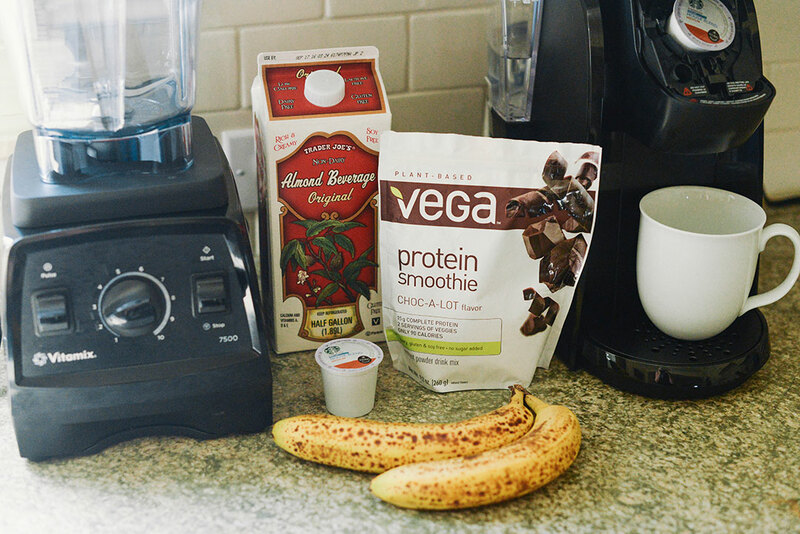 Unpeel your banana and throw into your Vitamix with the Vega protein powder. Pour in coffee + almond milk mixture. Add a cup or so of ice and blend! I hope you enjoy this recipe as much as I have! Let me know what you think!! Oh yummy – that sounds so delicious! I love smoothies! Looks so good – definitely bookmarking this one! Hope you had a blast bowling yesterday! The snaps looked super fun! This looks fantastic, I have to give it a try! I have been on a smoothie kick lately and have been wanting to try different ones. Yum – this sounds so good!!! My go-to is peanut butter, banana, almond milk, and whey protein. The best.